The creatinine clearance test helps provide information about how well the kidneys are working. 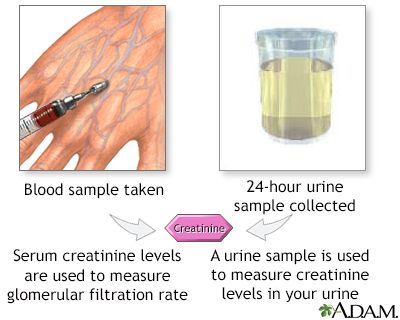 The test compares the creatinine level in urine with the creatinine level in blood. This test requires both a urine sample and blood sample. You will collect your urine for 24 hours and then have blood taken. Follow instructions exactly. This ensures accurate results. Your health care provider may ask you to temporarily stop any medicines that may affect the test results. These include some antibiotics and stomach acid medicines. Be sure to tell your provider about all the medicines you take. The urine test involves only normal urination. There is no discomfort. By comparing the creatinine level in urine with the creatinine level in blood, this test estimates the glomerular filtration rate (GFR). GFR is a measure of how well the kidneys are working, especially the kidneys' filtering units. These filtering units are called glomeruli. Creatinine is removed, or cleared, from the body entirely by the kidneys. If kidney function is abnormal, creatinine level increases in the blood because less creatinine is released through the urine. Male: 97 to 137 mL/min (1.65 to 2.33 mL/s). Female: 88 to 128 mL/min (14.96 to 2.18 mL/s). Normal value ranges may vary slightly among different laboratories. Some labs use different measurements or test different samples. Talk to your doctor to know about the meaning of your specific test results. Risks of the test involve the blood draw process. Chernecky CC, Berger BJ. Creatinine clearance - serum and urine. In: Chernecky CC, Berger BJ, eds. Laboratory Tests and Diagnostic Procedures. 6th ed. St Louis, MO: Elsevier Saunders; 2013:401-403.